Old Delhi, India, is one of the most chaotic and noisy places on earth. Ironically, it is adjacent to an unusually serene area honoring Mohandas Gandhi, whose campaign of non-violent civil disobedience led to Indian independence, earning him the honorific Mahatma (the Venerable). On August 15, 1947, the United Kingdom granted independence to British India, dividing it between largely Hindu India and largely Muslim Pakistan. Gandhi, who opposed the partition, spent the day — celebrated as Indian Independence Day — fasting to try to end the deadly violence between Hindus and Muslims precipitated by the partition. On Jan. 30, 1948, a Hindu nationalist fatally shot Gandhi at close range in the garden of a large house where he was staying. The assassin claimed that Gandhi’s tolerance of India’s Muslims was the primary cause of the sectarian violence, which left about 500,000 dead. The next day, Gandhi’s body was carried on a modified gun carrier from where he died to Raj Ghat, a traditional cremation area 5 miles away along the sacred Yamuna River. Two million grieving Indians of all religious traditions joined the funeral procession. Gandhi’s body was cremated on Jan. 31, 1948, and his ashes placed in urns that have found their way around the world. Today, Raj Ghat is maintained as a memorial to Gandhi. Visitors remove their shoes before entering a grassy area enclosed by stone walls and make their way to a black granite platform that marks the spot where Gandhi was cremated. An eternal flame burns along one end of the platform, which is inscribed with “He Ram” (“Oh God”), Gandhi’s supposed last words. The stark platform usually includes garlands of orange marigolds, a traditional symbol of hope and devotion. 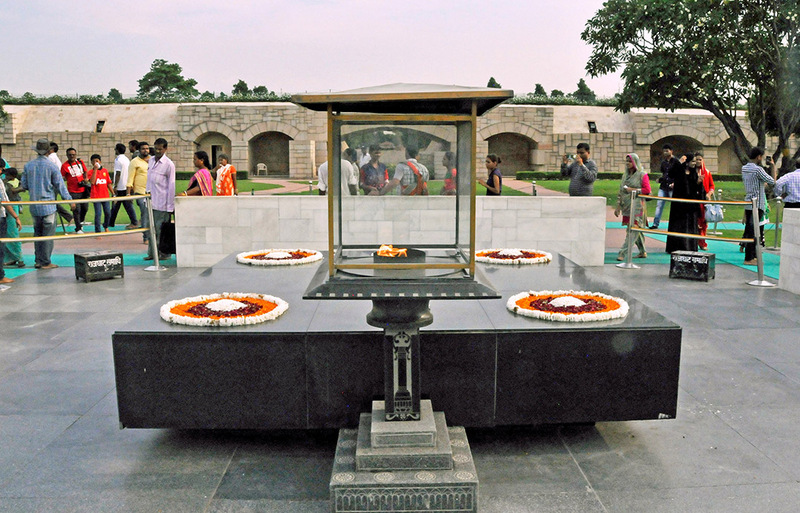 Raj Ghat is a must-see for visiting heads of state, who lay memorial wreaths on the platform.